Luigi Fioravanti is knocking the dust off his gloves and mouthpiece. Fioravanti, a veteran of over 30 professional fights, is stepping back into the cage on Saturday after a year-and-a-half away from it. Waiting for him will be another seasoned scrapper, Edwin Aguilar, the two will take part in Flawless FC 3 in Inglewood, Cali. Since relocating to St. Louis from Florida, where Fioravanti was a staple of the original American Top Team, he has spent the bulk of his time teaching, coaching, and training while nursing some nagging injuries. Fioravanti (22-11) last fought in October, 2011 when he lost to hard-hitting Paul Daley by decision in Canada. “He broke my fingers in the fight when I caught a punch because he hits like a Mack truck,” Fioravanti added. The nine-time UFC veteran has fought some big names along the way in Jon Fitch, Diego Sanchez, Chris Leben and Anthony Johnson among others. In Aguilar, the Brazilian Jiu-Jitsu black belt Fioravanti will come face-to-face with a striking specialist. Aguilar is 23-17 with 18 of those wins coming via knockout. While on the surface their experience may seem close to similar but Fioravanti doesn't see it that way. Fioravanti has gone as far to question his career path should he lose on Saturday. With such a long time between fights, the issue of ring rust has to come up. Though he has been away from the cage for some time, it hasn’t all been by his choice. You would think that a nine-time UFC vet with a decorated fighting pedigree would be the apple of any promoter’s eye but that is not necessarily the case these days. Fioravanti signed with a new management team, Flawless Fighting Management, who hosts regional shows throughout California. Fioravanti has stepped away from gym in downtown St. Louis to focus on his fighting career and bounced around a plethora of places including St. Charles MMA, Finney’s MMA, as well as rolling with Army Combatitves from Fort Leonard Wood. 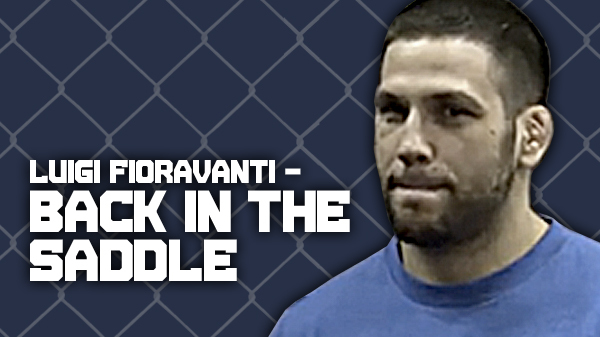 While for now he is concentrating on what he needs to do inside the cage, Fioravanti hasn’t turned his back on coaching. Watching and helping up and coming fighters and grapplers develop has been source of pride. Saturday’s fight will be at middleweight while Fioravanti will drop back to welterweight for his next fight against Chris Heatherly near the end of June. He has fought at both weights throughout his career. He has also come to the realization that now, over the age of 30, there is no such thing as out-training a poor diet. Fioravanti said that if things go well he would love to get another fight, maybe in early fall. But that’s then. Saturday and Aguilar are now and for the “Italian Tank”, getting back up on the fighting horse is something he is eager to do.